You know how we love our big, over-the-top cupcakes here at the DFB. We take ‘em filled with cream cheese, topped with Darth Vader, sprinkled with edible glitter, and any and all combinations of the above! Cupcakes tend to take some of the top spots in any Disney World bakery case, so typically they aren’t remotely hard to spot. But there is a little cupcake gem that really hasn’t received its proper due… The Lemon Blast Cupcake can only be found in the Sunshine Seasons bakery case in Epcot’s Future World, and more often than not, it’s hidden on the bottom shelf, well below the croissants, cookies, and muffins. One of our rad readers (thanks, Jessica!) 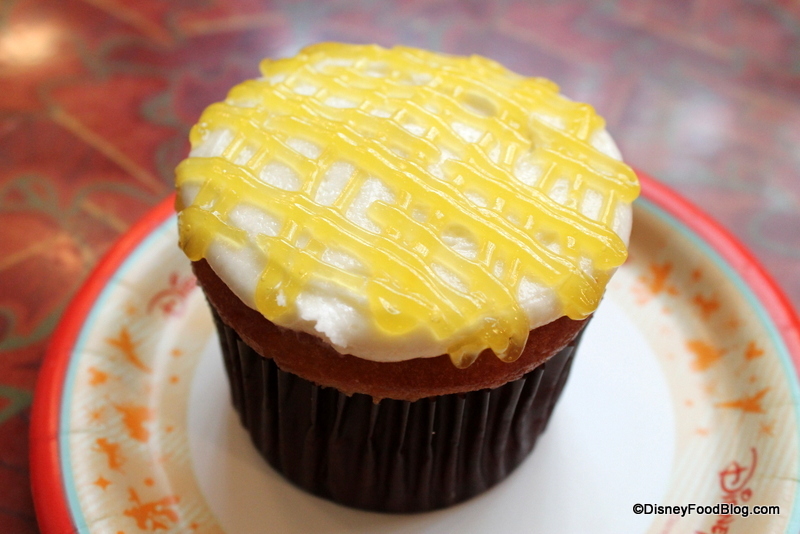 reminded us of this one, and it’s high time to give the Lemon Blast Cupcake a little DFB love! Aside from the zig-zaggy, criss-cross-y pattern of lemon (!) 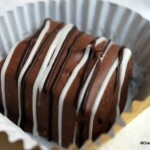 drizzled over the top, the rest of the cupcake is pretty basic… or so it seems. Vanilla frosting covers a yellow cupcake base. Weird, right? 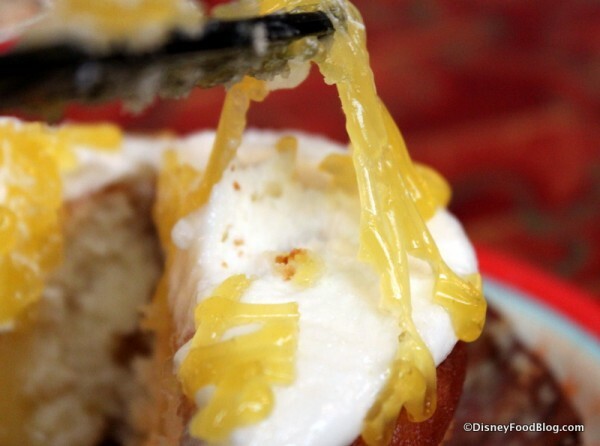 The piped lemon gel topping is a little stringy and a little sticky. So be warned. 😉 I’m not sure how I feel about it. Physically it’s kind of gross, but it tasted fine. So, there ya go. So what is inside, anyway? A lovely center of lemon curd. SCORE!!! You know how I feel about lemon curd. I hold a reverence for it that’s rivaled only by my love of plastic cheese. So whenever I stumble upon it, it’s a good day 🙂 . I don’t even mind (much) that the vanilla frosting is on the thin side. It keeps the lemon the star of the show, and helps it live up to its name. 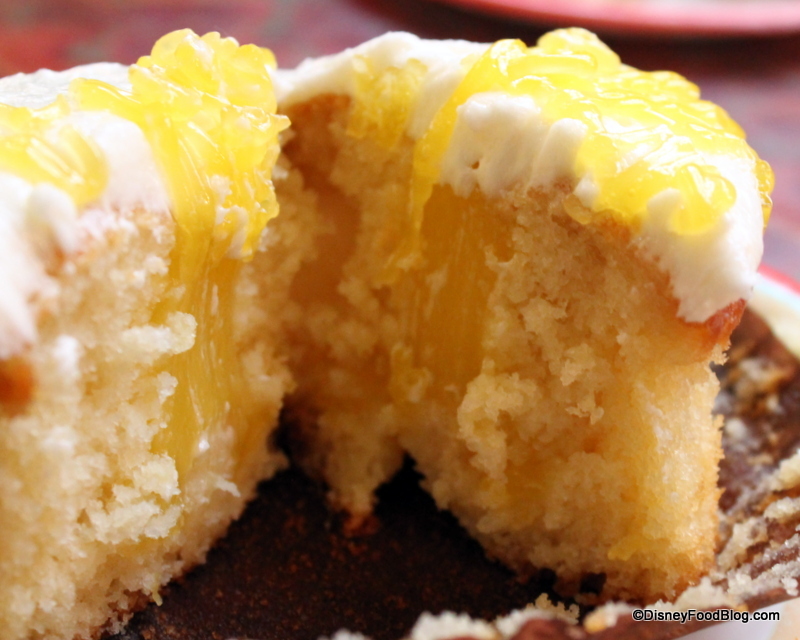 The burst of lemon coupled with the vanilla makes the Lemon Blast Cupcake is everything it needs to be. So to my fellow lemonheads, I say… get on it! 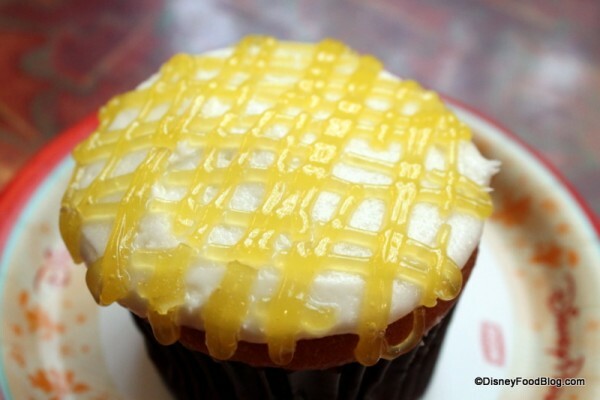 Have you tried the Lemon Blast Cupcake? Please let us know your thoughts with a comment! WOW never had one of these before – it looks really good! Yum! 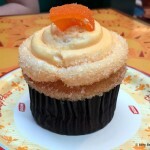 I’m always excited to see what the next new cupcake at WDW will be! 😀 This definitely does not disappoint! I’ve never tried it, but I’d sure like to; it looks wonderful. 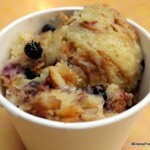 I ate this back in late August! It was terrific. Can’t get too much lemon! Oh, you just made me laugh so much. (The part about the lemon gel.) I love reading your reviews. Not just for the beautiful pictures and info about the food from one of my favorite places, but also because of your sense of humor. It really shines through in your writing and makes the blog a joy to read. Thanks! I, too, share your reverence for lemon curd. You could probably put it on a philly cheesesteak and I’d be all over it. 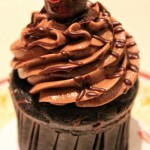 And as a cupcake addict, I love all the reviews on the many, many, many Disney cupcakes, making notes on the ones I need to try on my next trip. Luckily, we’re going later this month, but I have been unable to cut my list to under twelve. So that means twelve cupcakes in six days? Okay! I’m curious about the Apple Caramel Crunch sitting right above them. Are those cupcakes? Apples? I’m intrigued. Noooooooooooo, they replaced this cupcake. Jim — They do change out the cupcakes from time to time. We just had a reader send a pic a couple of days ago, so maybe it’s back? 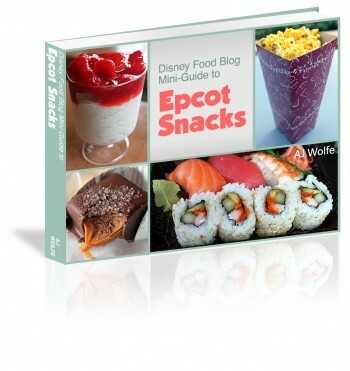 We’ll be in EPCOT this Sunday and was just checking out the possibly available cupcakes. 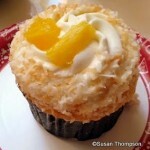 I’m hoping this Lemon Blast cupcake is back. I wasn’t too sure with that gel on top but that lemon curd in the middle. Ding! Ding! Ding! This looks like a winner to me! Nancy Nolan — I haven’t seen the lemon cupcake recently, but it may be back for the Summer season! 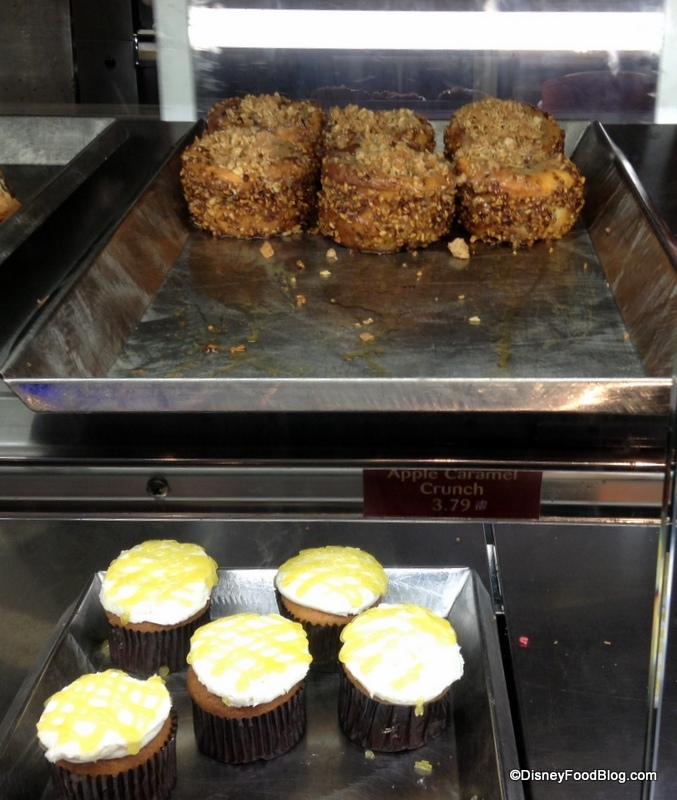 If they have the apple cupcake there, it’s adorable and delicious. Also great is the warm peanut butter brownie!